An overnight or multiday scenic diversion from the Routeburn Great Walk. 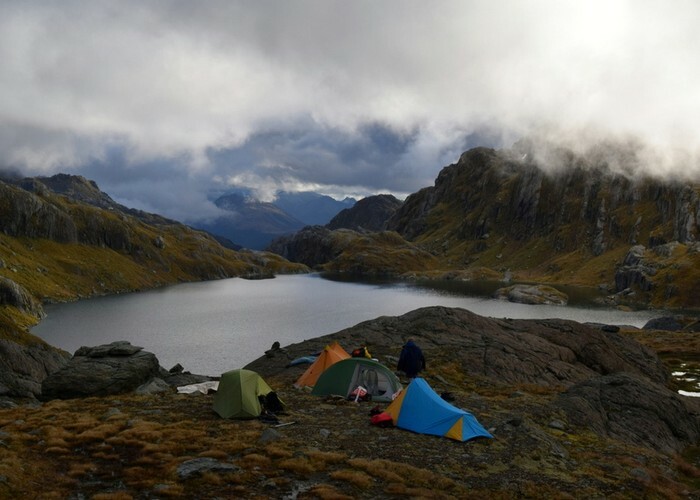 The Valley of the Trolls is easily accessed from Harris Saddle and provides overnight camping for those wanting to get away from the crowds, while Lake Wilson provides stunning alpine lake vistas with numerous peaks to climb. Camping at Lake Wilson • By Yarmoss. Licence: C.
Routeburn Shelter, Queenstown end of the Routeburn track. But you could also add this trip onto a South-North walk of the Routeburn from The Divide, or even from the Three Passes route if coming via the Serpentine Range from North Col.
From the Routeburn Shelter the Routeburn track is followed all the way to Harris Saddle. Being a Great Walk highway, speedy travel can be achieved. It takes about 2 hours to reach Routeburn Flats where the Routeburn Flats hut is located, a short detour of the main track. There is a picnic table here which is a great spot for lunch looking up the north branch of the Route Burn. The track now climbs up to Routeburn Falls which are reached in another hour. If this is your first time on the Routeburn it is well worth dropping off your packs and admiring the waterfall. The southern most falls can be accessed in their gorge for a chilly swim by climbing down to the river behind the helicopter pad. Continuing on, the track climbs steeply up past the falls and then climbs up and around a large alpine valley, at the top of which lies Lake Harris. It takes about an hour and a half to reach here and travel through the bluffs over looking the lake. At the top of the lake a low valley is clearly visible, this is the Valley of the Trolls. Routeburn Track • By lgwaddel. To reach the Valley of the Trolls you need to be just past the Lake Harris bluffs where the ground just starts to open up on the southern side. You wont have reached the Harris Shelter yet, which is a couple of hundred metres away just out of sight. Leave the track and head northwest, straight for the southeastern flank of Conical Hill. At the edge of the hill you'll be looking down a steeply sloping bank which drops all the way down to Lake Harris. Descend down this bank, near the bottom of which you might find a blue DOC triangle and a pest trap. This is the start of a DOC trapping line which runs right around the western shore of Lake Harris and on into the Valley of the Trolls although the traps and markers aren't always present. A light ground trail marks the trapping line, generally at or close to the waters edge, and it is this you follow around the lake. Travel is slow but not difficult, it takes about 30 minutes to get around the lake to the entrance of the valley. Theres flat ground for camping here by the Route Burn river mouth as it flows into Lake Harris. To carry on into the Valley of the Trolls, stay on the true right of the Route Burn and climb up and through the boulders that guard the valley entrance. There is a small rock bivvy located in among the boulders, it might hold 2 people somewhat uncomfortably. Once around the last boulder the valley opens up as a (sometimes) swampy grassland which can be squelchy underfoot but isn't difficult to cross. Despite the abundance of boulders around there is precious little shelter from where to camp in the valley if theres a cold northerly wind blowing down from above. The flat land can be boggy, the valley head is rough underfoot. Theres some flat, dry ground for camping near boulders at the northwest head of the valley, and there is a good bivvy located about halfway up the valley on the western side, about 40 metres above the valley floor. You would fit about a dozen people under the overhanging cliff here in various degrees of shelter, and theres room to pitch a couple of tents. Theres no water source here though so carry all the water you'll need for the night with you before the steep climb up! It takes about 30 minutes to reach this bivvy from the entrance to the Valley of the Trolls. To reach Lake Wilson, make your way up to the head of the valley, following the true right of the stream up valley, and crossing over to the true left a short distance from the falls. An obvious grassy gut climbs up the hill parallel to the true left of the falls, which is the route to Lake Wilson. Another gut on the true right of the falls has been used as a route to and from the southwest corner of the lake but is considerably steeper and more difficult then the true left gut. About half way up the true left gut, a nasty metre high rocky step is required to be climbed up, but otherwise the gut is a straight forward climb. The upper reaches of the gut are snowbound in early January so an ice axe is required, but by mid February should be snow free, making the final dozen or so metres of the climb like a slot canyon. At the top of the gut a rocky shelf runs south-north, its southern end providing a magnificent view over the Valley of the Trolls towards Harris Saddle and the peaks around, while at the northern end of the shelf lies Lake Wilson. There is camping here above the lake outlet with a fine view up the lake if somewhat exposed to northerly winds blasting down the lake. It takes about 45-60 minutes to reach here from the Valley of the Trolls. Lake Wilson from the outlet • By Yarmoss. Licence: C.
Another route for reaching Lake Wilson is to follow the stream which flows down to the Valley of the Trolls from the north flank of Mt Xenicus on the topo map. Climb up the gully on the true right side of the stream initially, then when you reach the first fork of the stream at about the 1400m contour cross over and follow the true left (the true right is still followable, the true left is just easier). At about the 1460m contour recross the stream and climb northwards to gain the ridge line running southwest from Point 1578. There is camping on flat patches along this grassy ridge but locating water might be a problem later in summer. The small gully running south from east of Point 1578 holds snow and a meltwater lake in early summer and has camping nearby. There is a rock bivvy on the western side of the gully, just southeast of Point 1578 and north of the letter "k" of "Lake Wilson" on the topomap. It is dry and holds 3. What to do at Lake Wilson? The two obvious suggestions are a tour of the lake, and a climb of Mt Erebus. Summating Mt Xenicus is also a possibility but it looks a much more serious challenge then Erebus. The outlet is easily forded, its barely over the tops of your boots, and from the western shore of Lake Wilson Peak 1647 is easily climbed and the ridge line north as far as Peak 1680 followed. There is flat ground for camping near the small island on the western shore and also near the lake that lies northwest of 1647. The ever changing vista of Lake Wilson remains superb throughout. The southern approach of Peak 1680 is rocky and tricky, some route finding trial and error is required, but the view from the top is rewarding. 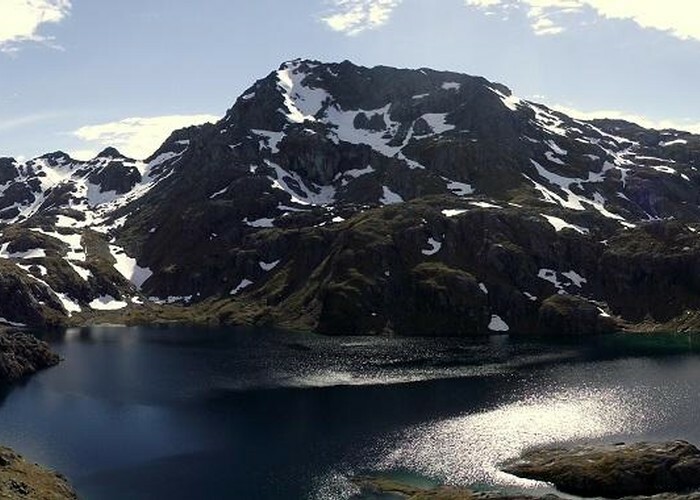 Drop down the steep northern flank of the peak to the saddle between 1680 and 1772, from which a steep slope provides a short glacade when the slopes at the head of the lake hold snow. In January 2013 there was a lot of snow around up here but very little in January 2017. 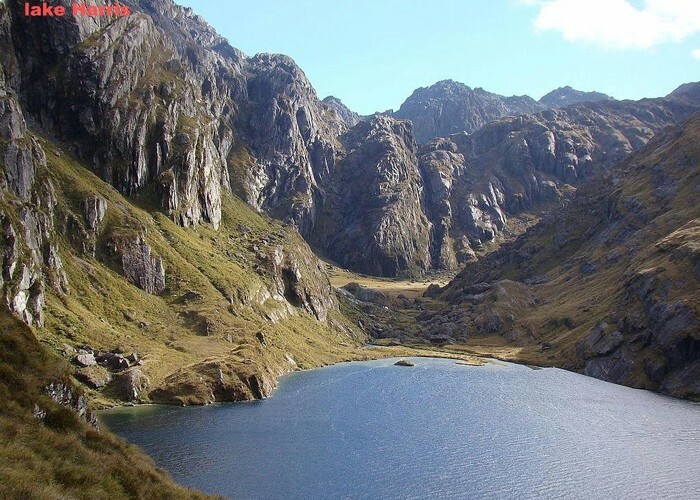 You can also traverse around at a lower altitude by passing through gullies at about the 1480m contour through crazily bluffed terrain at the northwest corner of the lake. There is pleasant camping near stony "beaches" at the lake's head to be had where two streams flow into the lake at CB09 180389 and CB09 182388, and there is good camping on terraces up on the 1500m contour. A gully west of Mt Erebus has to be passed through at about 1500m, its southeastern side is steep so care is required here. Climb to about 1550 metres to gain the flatish land north of Point 1578, skirting the edge of a large boulder field. From here the ridge line that runs southwest is easily followed back down to the lake outlet. A circuit of the lake takes at least 3 hours and could last all day depending on how many of the peaks you feel like climbing. There's good swimming in the lake near the outlet and at the beaches at the lakes head (when the snow is gone!). Climbing Erebus can be done by at least 3 different routes. Two go up the western flank from Point 1578, the third route goes up the stream that runs down from the north side of Mt Xenicus. This stream goes all the way up to just below Peak 1829 and can be climbed the whole way up or take the couloir to the northeast between Points 1821 and 1829. You then follow the ridge line around the east flank of Peak 1821 and then all the way up to Erebus. I went up the west flank of Erebus, picking my way through bluffs to gain the ridge line at about 1860 metres, and down via this stream route, but early summer snow on the main ridge line potentially makes things difficult. You'll almost certainly need an ice axe into late Feb. The views from the top are splendid. You'll need about 4 hours for the climb up and down. Lake Wilson Panorama • By Yarmoss. 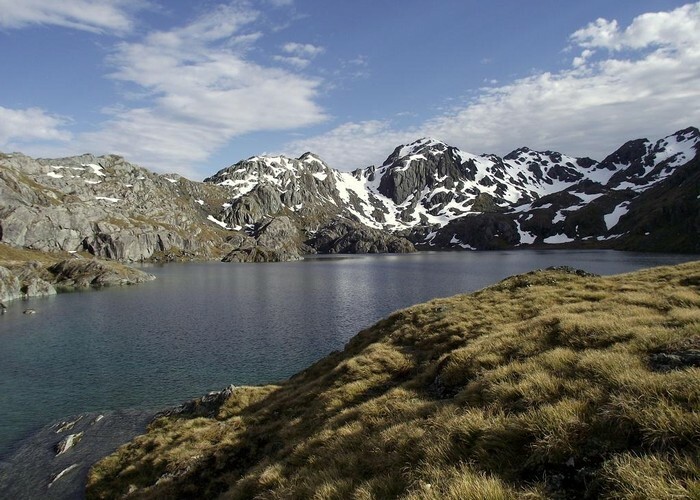 Licence: C.
To leave Lake Wilson return to the Valley of the Trolls either via the stream or the true left gut, and sidle around Lake Harris to reach Harris Saddle. It takes about 5-8 hours to return to Routeburn Shelter. Added 3 April 2013 by YarmossYarmoss. 17 revisions, most recently 28 February 2018 by YarmossYarmoss. 1,456 views in the past year (121 per month).